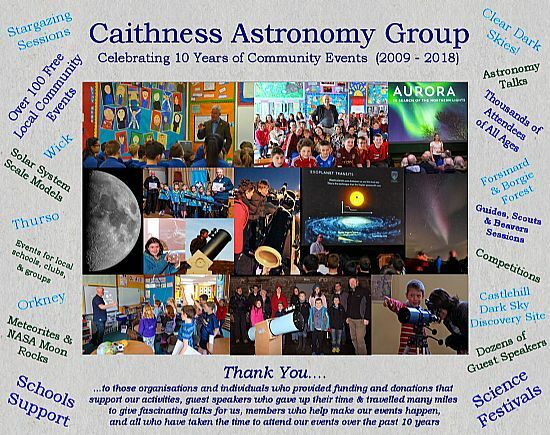 In December 2018, Caithness Astronomy Group celebrates its 10th year promoting Astronomy and space related subjects, both with its members and in the wider Caithness, Sutherland and Orkney communities. The Group is proud to have taken part in science festivals, supported local schools with the space related curriculum, given free talks for local groups like Scouts, Beavers, Guides, camera clubs and the Women’s Royal Institute. And also, to have been able to bring Moon rocks and meteorites to Caithness for the public to see…….and touch……. those little bits of star dust. Our public events have encouraged people to look up and see eclipses, the detailed surfaces of our Moon and Sun, Mercury passing in front of our sun, comets and asteroids whizzing past our planet, aurora, stars, planets, distant galaxies and much more. We have brought a myriad of enthusiastic speakers, all experts in their fields to Caithness to give public and school talks on subjects ranging from the Moon, the Sun and how our ancestors saw these celestial markers, what space probes and landers have told us about comets and many of our neighbouring planets and their moons. And what science is uncovering about our Solar system and way, way beyond. We have even helped the local tourism sector who have an interest in promoting our dark skies for visiting stargazers and Aurora hunters. And actively promoted Castlehill to become Britain’s most Northerly location to gain “Dark Skies Discovery” status. We'd also like to thank all who took the time to attend our events and join in our passion for better understanding what's out there beyond our home planet. Our 10th Anniversary event had Prof Martin Hendry MBE giving a fascinating talk on gravitational waves and joining us in our celebrations. 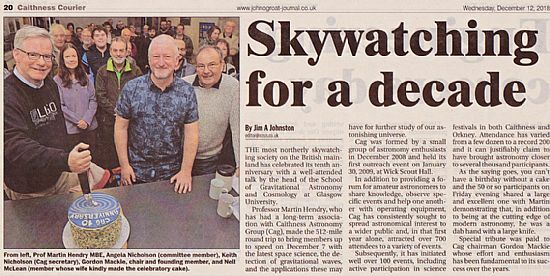 This was particularly fitting of the occasion as Martin has been a long time supporter of CAG, and someone who was instrumental in our Group getting started 10 years ago.